i have some personal news and that's that i don't think i'm a future village champion curler of america. or maybe i'm just judging it too quickly? but ok, imagine this: because i was a former mathlete and know a thing or two about angles and curves, i was elected to be the skip, which is the position that stands down at the far end of the ice to give aiming directions while everyone else (i.e. all of your friends who you signed up with) waits to throw the stone (i.e. hangs out and laughs and forms inside jokes and strengthens their friend bonds). so there i was, spending my three units of social time for the week trying to make small talk about the fabled beer vending machine that's hidden deep in the back room of the curling barn with a total stranger and failing miserably and watching my friends at a very long distance laughing and having the best time ever. so i quit. conveniently, the class session ended that day so i didn't need to be dramatic about quitting mid-season and letting my team down, not that i was of any real value anyway, but i'm glad i tried! it was a really fascinating learning experience and maybe i'll take it back up again once i find a teammate who is socially confident enough to not get fomo while watching a bunch of people whom they can't interact with have fun. could i put out a craigslist ad for a skip? female, 26, seeks platonic friendship with introverted calculus whiz who can lunge well. errmm...for now i think i'll devote all my free time to master of none. what a great show! i wanted to make you a grape salad as a nostalgic nod to #grapegate for thanksgiving. 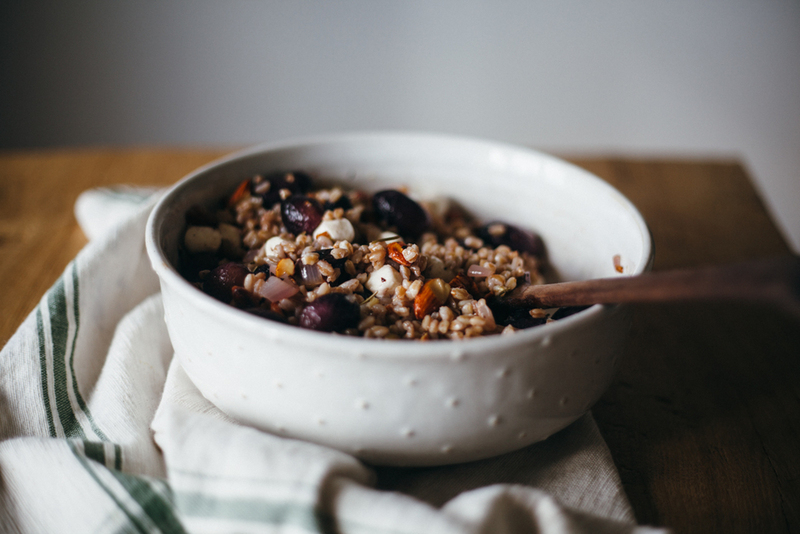 but i came up with this farro salad with roasted grapes, because 1) ohmygahh grapes deserve better than to be dressed in an outfit of sour cream, and 2) i'm going through a farro stage. it's such a fancy yet hearty grain! i've been using it lately where i would normally use israeli couscous or rice. (my first foray into farrotto happened over the weekend and it was a success.) this salad is great warm or at room temperature, and the rosemary, toasted almonds, and roasted grapes lend some wonderful fall flavors. i've been putting some fresh mozzarella in mine, but if you're looking for a vegan dish for your thanksgiving table, this will totally hold up without the cheese. and speaking of vegan thanksgivings, um, i think i'm gonna make a squashducken...???? preheat the oven to 425ºf. line a baking sheet with parchment and spread out the grapes (remove them from their stems). drizzle them with 1 tablespoon olive oil and a pinch of salt and pepper and roast for 30 minutes. while the farro is simmering, place the remaining 3 tablespoons of olive oil in a small pot with the shallot and simmer it over medium heat. remove it from the heat once the farro is done cooking and stir in the vinegar. add the grapes, almonds, and mozzarella (if using) to the bowl with the farro and drizzle it with the shallot mixture. toss to combine. salt and pepper to taste. serve warm or at room temperature. enjoy! this post is sponsored by grapes from california. all opinions are my own!